In the #1 New York Times bestselling series’ latest thriller, Mitch Rapp finds himself alone and targeted by a country that is supposed to be one of America’s closest allies. After 9/11, the United States made one of the most secretive and dangerous deals in its history. The evidence against the powerful Saudis who coordinated the attack would be buried. In return, King Faisal would promise to keep the oil flowing and deal with the conspirators in his midst. When the king’s own nephew is discovered funding ISIS, the president suspects that the Saudis never intended to live up to their agreement. He decides that the royalty needs to be sent a message and that Mitch Rapp is just the man to deliver it. The catch? America can’t be seen moving against an ally. Rapp will be on his own. Forced to make a decision that will change his life forever, Rapp quits the CIA and assembles a group of independent contractors to help him complete the mission. They’ve barely begun unraveling the connections between the Saudi government and ISIS when the brilliant new head of the intelligence directorate discovers their efforts. With Rapp getting too close, he threatens to go public with the details of the post-9/11 agreement between the two countries. Facing an international incident that could end his political career, the President orders America’s intelligence agencies to join the Saudis’ effort to hunt the former CIA man down. Rapp, supported only by a team of mercenaries with dubious allegiances, finds himself at the center of the most elaborate manhunt in history. It’s only a matter of time before he’s caught or killed. Will it be enough to turn the tables on the Saudis and clear his name? #1 New York Times bestselling author Vince Flynn (1966–2013) created one of contemporary fiction’s most popular heroes: CIA counterterrorist agent Mitch Rapp, featured in thirteen of Flynn’s acclaimed political thrillers. All of his novels are New York Times bestsellers, including his stand-alone debut novel, Term Limits. 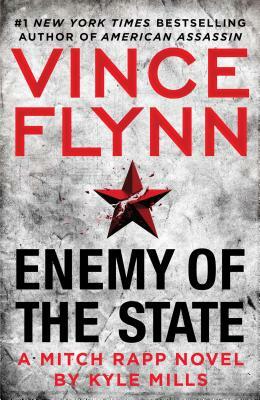 The Mitch Rapp story begins with American Assassin, followed by Kill Shot, Transfer of Power, The Third Option, Separation of Power, Executive Power, Memorial Day, Consent to Kill, Act of Treason, Protect and Defend, Extreme Measures, Pursuit of Honor, The Last Man, The Survivor, Order to Kill, Enemy of the State, and Red War. American Assassin was released as a major film in 2017. Kyle Mills is the #1 New York Times bestselling author of nineteen political thrillers, including Red War for Vince Flynn and The Patriot Attack for Robert Ludlum. He initially found inspiration from his father, the former director of Interpol, and still draws on his contacts in the intelligence community to give his books such realism. Avid outdoor athletes, he and his wife have lived in Jackson Hole, Wyoming, for over twenty years. Visit his website at KyleMills.com. "Series fans and newcomers alike will watch in wonder as Mitch Rapp executes a clever plan that leads to an explosive climax." "In the world of black-ops thrillers, Mitch Rapp continues to be among the best of the best." "This novel perfectly combines geo-politics, covert operations, and the backstory of the characters. Readers can close their eyes and remember past books written by Vince Flynn and will not skip a beat with Kyle Mills at the helm."